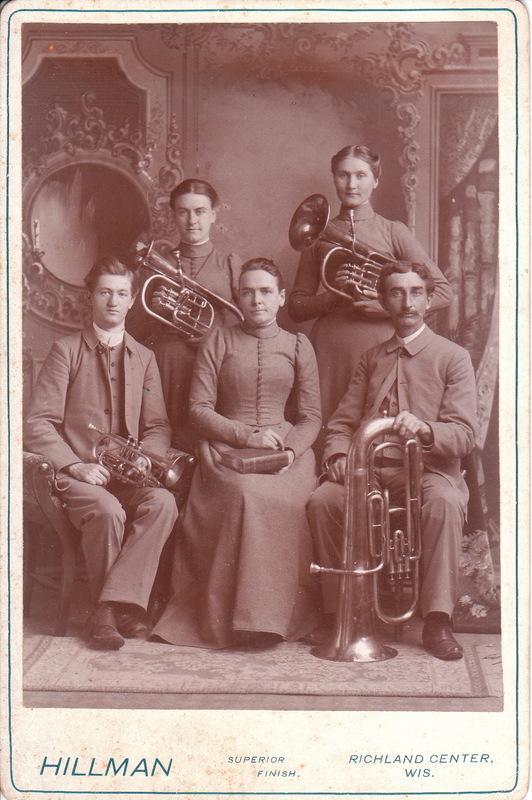 This cabinet card features five members of a brass band dressed in uniform. The band band does not appear to be an “ordinary” community band. The woman seated in the center of the bottom row has a bible on her lap. The band has the look of a salvation army band but they are not wearing salvation army uniforms. Most likely, these musicians are members of a religious based service organization. Perhaps a visitor to the cabinet card gallery will be able to identify the organization that these band members represent. This cabinet card is notable for its clarity and for the detailed view of the musical instruments. The photographer of this cabinet card was the Hillman studio of Richland Center, Wisconsin. The 1900 US census reports that William J. Hillman was a 51 year-old photographer, born in New York, and living in Richland Center with his wife Caroline (age 54) and his son Charles B. (age 22). Charles B.Hillman was listed as working as a photographer. The Photographic Times (1907) printed a paper read by Hillman. The paper was entitled ” The Successful Photographer” and the advice given in his presentation was excellent and would be relevant and helpful to modern day business owners. If Hillman was alive today, he would have been an incredible business consultant. The Bulletin of Photography (1914) contains an announcement that the Hillman studio was sold to Frank Dickson.